A comprehensive plan is a collection of information and materials designed to guide the future development of a city or county. Typically a comprehensive plan will provide general policy guidelines regarding transportation, utilities, land use, recreation, and housing. 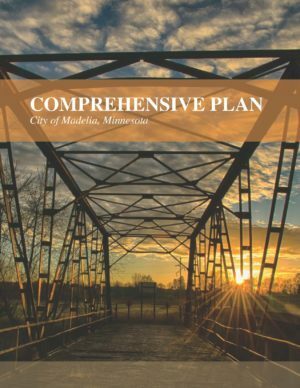 Comprehensive plans often reflect the combined efforts of mayors, city council members, planning commission members, parks commissions, and other community-based organizations that comprise the community’s comprehensive planning task force or planning team. Once the plan is in place, it is meant to be a living document and can be updated when necessary to continue to provide an accurate picture of the community’s goals. Communities throughout Minnesota are experiencing change. When a comprehensive plan is in place, the community and potential residents or developers have advance knowledge of the intentions of the city or county. A comprehensive plan can help communities make sound decisions about their future. How is a comprehensive plan created? The creation of a comprehensive plan involves a great deal of research, calculation, and discussion. Developing many of the plan elements requires a high degree of technical knowledge. For this reason, the process is best guided by trained professionals. Even cities with a planning department often hire a consultant to assist in the creation of their comprehensive plan. The plan should include significant public participation. Numerous public meetings should be arranged and special effort should be made to encourage attendance and distribute information about the process. Once the plan is finished, the planning commission and the city council should formally approve the document. Although the comprehensive plan does not contain actual laws or regulations, this formal approval will lend strength to future legislation that is based upon the plan. Likewise, future work by any city agency or body should be compared to the comprehensive plan and should be consistent with it. How can Region Nine help?